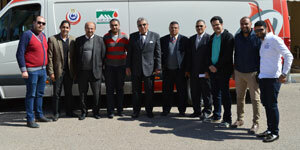 A blood donation campaign was launched by the Student Activities Department, in collaboration with the Community Service and Environmental Development Centre at Pharos University. The campaign lasted for two days; from Tuesday 7/3/ 2017 to Wednesday 8/3/2017 from 11a.m. to 2 p.m. in front of the food court. A large number of students participated in the campaign.